This festive slot themed on our favourite days of the year is five reels and 25 paylines slots. 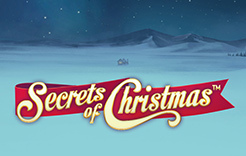 Secrets of Christmas brings with all the excitement and fun of the festive season. Um framkvæmdaraðila Leyndarmál jólanna- Join Now! NetEnt came into being in 1996 and has gained substantial experience in developing a variety of casino software. Their video slots are known for their amazing graphics and animations along with unique features and functions. This video slot casino game is also powered by NetEnt. Play professionally - earn professionally! This video slot casino game is played using 5 reels and 25 fixed paylines. This game is accessible to play on all compatible devices from 25p to 125 for a spin. A wooden lodge is the premise of this game and the action takes place inside this lodge. The reels are decorated on all sides with Holly. The symbols present on the reels are all as per the theme of the video slot casino game. The symbols are milk and cookies, bells, a sack full of toys, gingerbread houses and yes Santa. Standard playing card icons from 10 to Ace are also present on the reels. The most valuable symbol in Secrets of Christmas is the bell that rewards you with 1,250 times your line bet for landing five on a payline. The wild symbol is the Santa which can appear on all five reels. Santa replaces all symbols excluding the scatter. The medley of all-time favourite Christmas tunes can be heard in the background. Free Spins- There can be 2, 3, 4, 5, or 10 more free spins. Multipliers- 1x or 2x multiplier may be applied to your total win. Wild Reels- You can also have 2 and/or 4 reels fully wild during the spins. Additional Wilds- The bell and/or the candle may become wild during the spins. The players will like the Christmas spirit of this video slot casino game while discovering the gifts brought by Santa this time.